Is Caralluma the next Hoodia? As we have all heard and I have written here. Hoodia is one of the most popular loss products on the market today even if there is very little research confirming it but in the world of loss anectodal evidence is all that really matters. 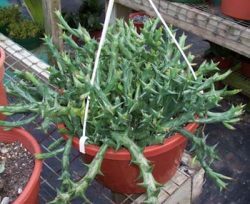 Caralluma is the same type of plant, a succulent and many people believe that it will be the next hoodia with some research,however small, showing positive results and people are making some losses. The really nice thing about Caralluma and Hoodia is that they have been used voer thousands of years and we know that in using them in moderation there are no obvious health issues. Caralluma fimbriata is a succulent plant, in the cactus family. Where have we heard this before? Hoodia anyone? Caralluma has been used as a natural appetite suppressant in India for centuries. Caralluma is a “new” discovery in the west in the family of cactii and succulent plants that are becoming increasingly popular for their appetite suppressant, and loss properties, as well as their ability to lower blood sugar. Like hoodia, Caralluma Fimbriata has been used to suppress appetite, and as a portable food for the outdoors as opposed to how we in the west have always used dried fruit and dried meat. It is used to suppress hunger and appetite, and enhance endurance throughout India. It is also sometimes considered a “famine food,” used during periods of famine to suppress appetite. Caralluma Fimbriata is essentially a vegetable of daily use in tribal India. It is eaten in several forms. It is cooked as a regular vegetable with spices and salt. It is used in preserves like chutneys and pickles and is even eaten raw. Indian tribals chew chunks of Caralluma Fimbriata to suppress hunger when on a day’s hunt. This succulent is used amongst the labor classes in South India to suppress appetite and enhance endurance. Two clinical trials of a proprietary Caralluma fimbriata extract (Gencor Pacific, Inc., Austin, TX) found the product to be without any serious side effects.6,11 The extract is described as a powder alcohol and water extract of the shade-dried aerial parts of the plant and containing not less than 10% total saponin glycosides, 3% bitters, and 25% total pregnane glycosides.7 Specific active components are noted to include luteolin-4?-O-neohesperidoside, kaempferol-7-O-neohesperidoside, sitosterol, tomentogenin, and pregnane glycosides, including caratubersides A and B and various boucerosides. In a double-blind, placebo-controlled, randomized trial on potential -loss effects, the Caralluma extract was administered in gelatin capsules initially to 62 obese subjects, 50 of whom completed the 8-week study. Subjects were of both genders, in normal health, not taking medications, and had not dietary restrictions during the trial. Reasons why the 12 subjects failed to complete the trial and the dosage used and quantitative results are not found in the summary made available for this report. According to the trial summary, reductions in the indicators of -loss were statistically significant and all adverse effects were gastrointestinal (constipation, moderate acidity, and flatulence), reported by both the placebo and the extract treatments groups, and transient (subsided within 7 days without further incidence). A 4-week, randomized, placebo-controlled trial of Caralluma was conducted in 26 over subjects (7 in the placebo group and 19 in the extract group; 9 men and 15 women ages 31 to 73). The extract was supplied in gelatin capsules at a dosage of one 500-mg capsule 30 min. before each meal. Subjects were instructed to maintain their previous exercise pattern and food intake and not to make any changes in their diet during 4 weeks before the treatment period, neither of which are described in the publication made available for this report. One male in each of the treatment arms of the trial failed to appear for final assessments; however, the reasons for their absence were not stated in the publication. The only adverse effects reported were from one subject in the final placebo group (3 males and 3 females) and one in the final extract treatment group who both complained of bloating and acidity shortly after beginning treatment and upon starting treatment again after ceasing. Subsequently, both discontinued the Caralluma capsules. The trial summary states that over 80% of those in the final treatment group (5 men and 13 women) lost with 11 out of 18 subjects losing approximately 6 pounds. Others lost 1-2 pounds or maintained their starting . The exceptions in the extract group were one woman who lost 8 pounds, another who lost 9 pounds, and one who deviated from the trial instructions by increasing her calorie intake and gained 17 pounds. Three subjects in the placebo group gained a pound and one subject lost one pound. Will Caralluma become a more popular diet pill? Take this as you would like but it seems that Caralluma is poised to be one of the new most popular loss products. One thing to watch for in the news is how easily this product will be to grow and produce as there are many companies that can package and market and with few if any side effects there will be very little resistance to a “new” indian loss product Caralluma. nie mog? si? zgodzi?, ale i tak jest ca?kiem nie?le. Who did you order from? This is not right there is no way that you should be charged and especially when you bought and did not receive. Let me know how it goes. I do not think that Oprah has anything to do with the company so it would be best to keep calling whichever company it is directly. I do know that I have had no complaints at all before about these guys that this product is from. They deliver on time and never bill people for something that is not owed for. I have a complaint, we ordered this back in november,2008. we were billed 3 different times and have never received any product as of yet!! And now on March, 2009, we have another payment taken out of our account and have yet to receive anything yet. I have tried callng, tried emailing oprah since that is how we heard about it. And yet we have not gotten any response. I even tried looking up the bbb for a complaint. i need to know what to do about this? I must give credit to this product as I want to stop gain any more , after using it I have been eating a lot less and get good energy boost. So far it helps me in a better way with no side effects but you have to little be patient before you feel a change in appetite. Starting to see this one take off. Good to see a number of exciting options for losing those extra pounds. A lady that I spoke with stated that upon using a supplement by the name of NonLipo with the caralluma in it she lost quite a bit of while in bed with a broken leg..I’ve just ordered a bottle.. Does anyone know of any other products with this plant in them? Is this expected to catch on like Hoodia has? Slimaluna is one product that has this in it. haven’t tried it, though.